Electronic complexity in automobiles has increased rapidly, making testing these electronic sub-assemblies very challenging. At Pickering, we understand these challenges—since 1988; we have been designing and manufacturing commercial PXI, PCI and LXI switching systems and sensor simulation for automotive test applications. These applications range from simple body controllers, ABS brake modules, dashboard testing, transmission control, airbag squibs, engine management units, and BMS testing to active safety and infotainment systems. Our capabilities and expertise are the reasons why major automotive companies including TRW, Delphi, Lear, BMW,Tesla, Caterpillar, Magneti Marelli, Robert Bosch, Renault, Peugeot, Siemens, Continental Automotive, Johnson Controls and many more specify our PXI, PCI and LXI switching and sensor simulation products for automotive functional test. We have developed a number of modules optimized for the automotive electronics industry and we are focused on ways to make Electronic Control Unit (ECU) testing easier, faster and more reliable. Have an application that you need help with? Contact us to discuss it in detail. Take a look at our success story: Pickering's Modular PXI Products Chosen for Automotive ECU Fault Insertion where our PXI modules were chosen for use in a test system that validates the design reliability of their Engine Control Units (ECU). Virtually all ECUs, from simple body controllers to Engine Management Units (EMUs), need signal switching and sensor emulation for adequate testing. Switching can be high current for motor control and low level for control functions. Temperature and altitude sensors are resistive in nature and are easily emulated for test applications. As Gasoline powered vehicles move toward a 42 V power platform, higher voltage switching needs to be selected. With electric vehicles, 400 to 600 V may be prevalent on ECUs. HIL simulation can be used to simulate the reaction of an ECU to external fault conditions such as a broken wire or a faulty temperature sensor, giving you the power to thoroughly test the ECU in a virtual environment before proceeding to production level testing. Using HIL simulation, all possible electrical short and open circuits are simulated, erroneous sensor data is applied and the ECU reaction captured to see if the design works as defined. You can achieve greater reliability in a cost effective manner no matter how complex the system being tested has become. For high-speed impedance matched applications, we feature specially designed Fault Insertion modules that form part of our range of PXI fault insertion switches, by far the largest in the industry. The ability to simulate the resistive nature of many of the environmental sensors in the engine compartment and vehicle cabin is important when it comes to EMU and Body Controller test. When testing ECUs that control airbags, being able to simulate vehicle accelerometers allows the test to verify if the squibs will fi re correctly. Pickering has the largest range of programmable resistor solutions, in both PXI and PCI formats, featuring down to 2mΩ resolution on multiple channels with accuracies as high as 0.03%. We also offer the only strain gauge emulators in both PXI and PCI—now you can easily incorporate strain gauge tests on safety related ECUs. Testing of multiple ECUs in an environmental chamber requires the sharing of external instrumentation and resources to stimulate and collect data from the ECUs over the cycles of the test. Our BRIC high-density switching matrices can provide over 4,400 cross-points in eight PXI slots, ranging in sizes from 4 to 32 rows and 10 to 552 columns. The BRIC’s IVI compliant drivers make it a simple task to integrate into software packages such as our Switch Path Manager signal routing software and National Instruments’ Switch Executive. In addition, our line of solid state multiplexers and matrices have virtually infinite switch life, making them ideal for extremely long environmental testing. If you prefer to use an LXI (Ethernet) interface, over 1,000 of our PXI modules (including the BRIC matrices) can be used in our LXI modular chassis. We also offer our LXI matrices (60-55X family), which have the same functionality as the BRICs and can be operated via an Ethernet connection. Whether you are testing low-frequency audio channels, Spark Coil Firing Patterns, MOST Fiber channels or the latest satellite radios—we offer signal-switching modules that address each application. SPST relays, multi-pole multiplexers or cross-point matrices are available with voltages up to 1000 VDC and bandwidths up to 65 GHz as well as fiber optic switching. Most PXI instruments lack the range needed to generate or capture data to test ECUs. For example, signal or arbitrary waveform generators lack the amplitude necessary to drive signals that simulate peripherals such as camshaft and ABS wheel sensors, and digitizers cannot adequately capture the primary input of a spark plug coil during discharge. Our high voltage amplifiers (model 41-650) features multi-channel, gain selectable amplifiers that work with many instruments including our function generator (model 41-620). Our high voltage attenuator (model 41-660) features selectable input ranges that accept up to 600 volt waveforms. The increasing feature sets of automobiles often require the use of RF components. Features such as Bluetooth, video and adaptive cruise control call for RF and Microwave switching in test. We offer RF solutions ranging from 500MHz to 65GHz, so we can address the vast majority of your RF and Microwave applications with our standard offerings. When testing body controllers, an important test is to see if the inputs respond to switches that are dirty and do not present a normal open/closed resistance. Our automotive switch simulation module (model 40-480) is designed to simulate the operation of up to 32 automotive switches where dirty contacts or leaking current can be expected from switch contamination brought on by age. The switch simulation allows automotive I/O devices to be tested for correct operation under adverse conditions. With the increasing adoption of electric propulsion systems in road vehicles, one of the major challenges to be tackled is the effective testing of the Battery Management Systems (BMS). We now offer our battery simulator module (model 41-752) to facilitate BMS testing. Take a look at our Knowledgebase for our article: “Developing a PXI solution for testing automotive battery management systems”. The testing of ECUs such as body controllers, ABS, electric power steering and transmission control requires the connection of high current loads to the Unit Under Test (UUT). 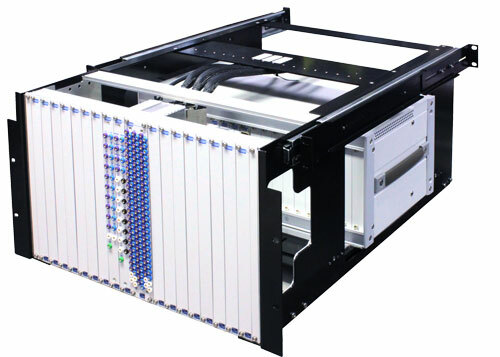 We provide a wide range of PXI switch modules that can support up to 40 Amp load switching within a PXI chassis. For higher current requirements, our PXI relay driver modules (models 40-410, 411, 412) let the test system control relays that are not easily supported within the PXI chassis. Also, our LXI high power matrix (model 60-600) can switch 10 Amps across up to 64 channels. Just providing the switching and instrumentation modules for automotive testing is not enough, you need fast and effective ways of connecting your investment to the device under test. All of our switching modules are supported by a comprehensive range of connector and cable accessories. With our technology and long-term expertise in automotive test, we have your automotive needs covered. Considering the broad range of switching and simulation products in our catalog, it is no wonder most major automotive electronics manufacturers specify Pickering for their test systems. Challenge us to solve your automotive test application problems - please contact us to discuss your application in detail.